Harry D. Lombard – a Boston banker-turned-Los Angeles real estate investor, who later was actress Carole Lombard’s godfather – moved into his newly-completed fifteen-acre Grayhall Estate in 1916. He was living in the country, surrounded by chaparral-covered hills and mountains. By 1916, only a handful of mansions had been built north of Sunset Boulevard, usually within a few blocks of The Beverly Hills Hotel, including Harry and Virginia Robinson’s home on Elden Way – and Burton E. Green’s estate on Lexington Road. Most of the several hundred residents of Beverly Hills lived in the flats south of Sunset Boulevard, and for good reason. All of the roads near Grayhall – such as Summit Drive and even Benedict Canyon Drive – were still unpaved. They were dusty in summer and muddy troughs after heavy winter rains. Coldwater and Benedict Canyons were still ranch land and citrus groves. 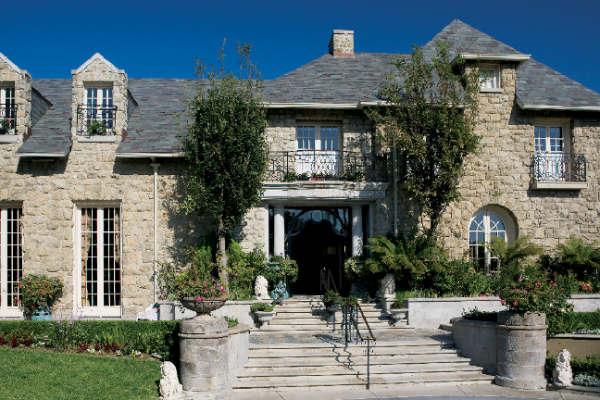 To get telephone service at Grayhall, Lombard had to build a line down to the five-year-old Beverly Hills Hotel. Despite its rustic setting, Lombard’s two-story mansion – designed by architects Sumner P. Hunt and Silas R. Burns – was elegant and comfortable in every way, starting with the grounds. Lombard had graded the property and completed the estate’s gardens and other landscaping soon after buying it in 1913. The mansion’s architectural style was an eclectic mix of traditional and then – contemporary elements based loosely on French Provençal, although some observers mistakenly described the house as Tudor or Tyrolean. The confusion, understandable – the house had a façade of costly gray stone, which gave the estate its name; a hipped slate roof with dormers; stone archways; and balconies with handsome ironwork. It also had expansive plate-glass windows –definitely not the French Provençal style – to take advantage of the spectacular ocean, city, and mountain views. A June 18, 1916, Los Angeles Times article praised the Lombard mansion: “The stone blends with the color of the soil, the walls looking as though they had grown out of the hill top. The place is patterned after an old castle in the Tyrol, modified to suit local conditions. A spoon-shaped swimming pool, a fine tennis court and grounds laid out so that they might offer a finished setting for the mansion, complete the estate.” The driveway, which started at Laurel Way just off North Beverly Drive, ran half a mile to the mansion. Despite its beauty and pioneering role in the foothills north of Sunset Boulevard, Grayhall’s greatest claim to fame; a tenant – movie superstar Douglas Fairbanks, Sr. By 1918, Fairbanks and Mary Pickford had been secret lovers for two years. He had divorced his first wife, and although Pickford had separated from her first husband, she was still legally married. Doug and Mary needed somewhere private to meet, and where better than an isolated country estate – Fairbanks leased Grayhall for a year.